MyDictation is the application that turns your iPhone into the best voice recorder and dictation system on the planet. The MyDictation application is full featured and allows the user to record any number of voice dictations and store them on your iPhone. When ready, with a single click, you can upload them wirelessly using either a Wi-Fi or cellular connection to the MyDictation server for transcription by your existing transcriptionist. All data transfer between your iPhone and the MyDictation web server is handled in a secure, HIPAA compliant fashion. 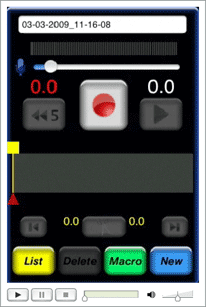 The MyDictation application is free to download and use for voice recording for anyone. We recommend not using the "auto delete files after successful upload" option and, instead, deleting recordings from your phone after you have received the completed transcriptions. Then, manually delete each recording. Don't pay hundreds of dollars for additional hardware for a dictation system. Stop losing dictations with cumbersome tape or digital systems. Stop sending dictation and transcription in a non-HIPAA compliant fashion. Send dictations SECURELY from anywhere with a cellular or wi-fi connection. In order to securely upload the dictations, an account is required on MyDictation.com at a rate of $19.95 per month with a one-month no-obligation free trial. 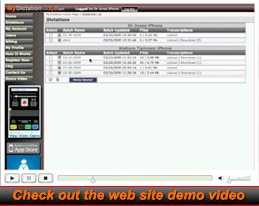 The MyDictation server allows your existing transcriptionist to download recordings and upload completed transcriptions for retrieval by you from anywhere on the Internet using only a web browser. All uploading and downloading is handled in a secure, HIPAA compliant fashion. Click on the image to the left to view a complete video demo of how to use the MyDictation.com web site to securely deal with all your dictation and transcription needs.